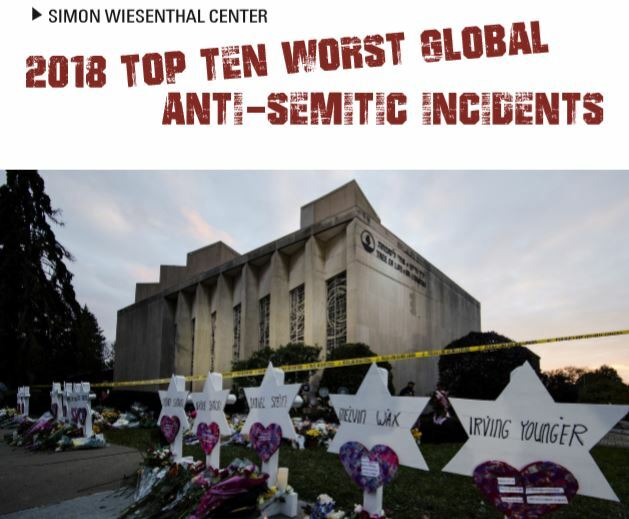 Year after year, the right-wing Simon Wiesenthal Center in Los Angeles publishes its shitlist of the top leading “Anti-Semites” or “anti-Semitic” incidents. It’s always funny to read about this organization distortion of reality and unworldliness. These yearly “Anti-Semitism” Awards come right after the famous Hollywood Awards. At the top of the list, rightly so, ranks the Pittsburgh Synagogue Massacre. Besides the usual suspects, such as Louis Farrakhan, the leader of the Nation of Islam, who is slandered by the Center almost on a regular basis, these Zionists apparatchiks also put Jeremy Corbyn, the leader of the British Labor Party, UNRWA, and AIRBNB on their shitlist. In October, AIRBNB announced it would delist rentals in Israeli communities in the West Bank. What the center doesn’t say is that the West Bank is illegal Occupied Palestinian Land. That the famous Pink Floyd singer Roger Waters takes only tenth place will perhaps disappoint him. The Zionists and their Philo-Semite enforcers are constantly slandering him that he should have come home second. Germans or German institutions are often on this ridiculous list. This time, the Bank for Social Economy finishes up in seventh place. Nobody should be surprised by this. Zionist extremists such as the campaign journalist Benjamin Weinthal and many others have put pressure on the bank to terminate the bank account of the group “Jewish Voice for Just Peace in the Middle East” because this group supports the BDS movement, which calls for a peaceful boycott of Israeli products from the illegal settlement in Occupied Palestine. That the Wiesenthal Center quotes Henryk M. Broder infamous judgment about the group (“a bunch of anti-Semites”) shows how fact-free, obscure, and insane their judgment is. Anti-Semitism is a form of racism. Racism in Israel is rampant. Israeli politicians should occupy all ten places. In 2017, I recommended Yair Netanyahu, the son of Prime Minister Benjamin Netanyahu, as a candidate on the organization’s Anti-Semitic shitlist, but to no avail. It seems the Simon Wiesenthal Center is not interested in the fight against real Anti-Semitism. They rather slander other people or organizations that speak the truth about Israel’s racist occupation and Apartheid policy.